Are You Weaning off Zoloft? If you are thinking of weaning off Zoloft you are about to make the best decision in your life. You started taking Zoloft to help with anxiety and/or symptoms of depression. Or you were told that you need something to reduce the edge? And you thought that Zoloft will change your life for the better. Yes, Zoloft could help some people and if you are one of them, how great is that. However, not everyone reacts to Zoloft in the same way. And if you experience any of the known Zoloft side effects, you might want alternative options to help your depression and anxiety. If you truly want to help yourself, there is no harm in setting a goal of weaning off zoloft. Of course, make sure you check with your doctor for medical advice for dose reductions. You want to avoid Zoloft withdrawal symptoms as much as possible. If you change your lifestyle, you might not need antidepressants. There are known common side effects of Zoloft which could jeopardize your relationships, career and even your life. You could have treatment-resistant depression, and no medication is going to help you. Since there are already three strikes against taking Zoloft, why not try lifestyle improvements first? Even if you have a friend, colleague or voice on the internet telling you how great Zoloft is for them, this does not mean that Zoloft is great for everyone. You run the risk of experiencing serious and negative side effects if you embark on the antidepressant cocktail journey. Start to think about your total health first. Zoloft might tranquilize you out of your depression, but you run the risk of losing your job. Or you might experience severe Zoloft insomnia. How well will you perform at your job if you cannot sleep for a few days? Not too good. You might experience Zoloft nightmares, beyond any nightmares you had ever seen. You might wake up from Zoloft night sweats drenched in a pool of your own sweat. 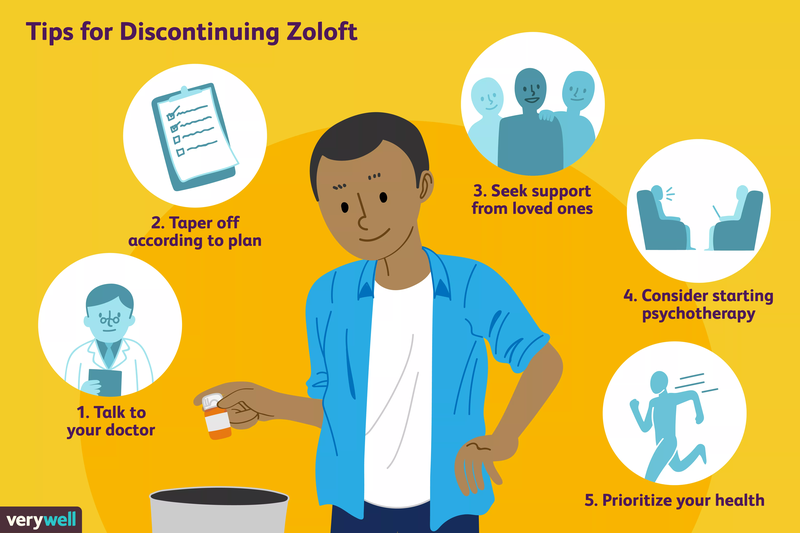 If Zoloft works for you, great, but MHA – Mental Health America estimates that there are over 20 million Americans suffering from treatment-resistant depression. Have compassion on your body and others who do not respond well to Zoloft or any other antidepressant. Is it worth taking the risk of antidepressants? With some moderate lifestyle changes, you can take the edge off as well without risking your mental and physical health. Why start on Zoloft if you may want to know how to wean off Zoloft 3 months later because you cannot handle the side effects? And then once you start weaning off zoloft, you need to avoid the symptoms of Zoloft withdrawal like brain zap, where you feel as if your head just got shocked with an electrical charge. 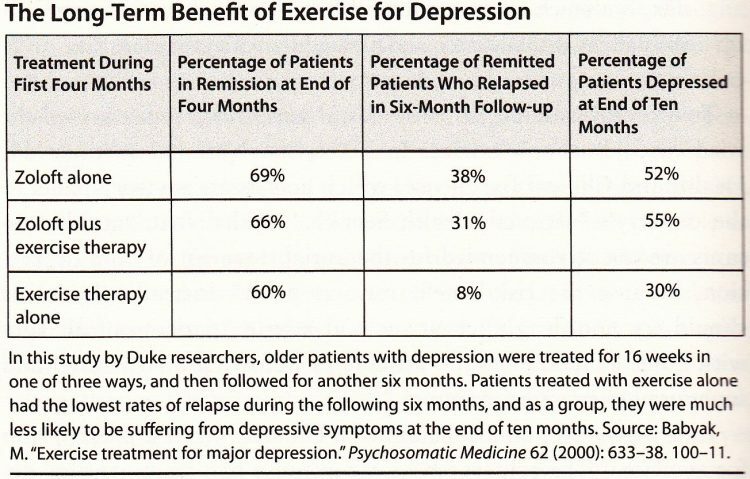 Look at this chart based on a Duke University study which shows the long term benefits of exercise for depression. We are not even talking about how nutrition and certain foods affect depression, just exercise alone. This can be as simple as taking a 30 minute to one hour walk every day. The results from exercise therapy alone are better than the results with Zoloft alone or Zoloft plus exercise therapy. Of course taking a Zoloft pill is an effortless way to raise your Serotonin than is walking for 30 minutes, doing squats, deadlifts or push ups. But, if you take the lifestyle modification route, you will get fitter and stronger while lifting your mood as well. On the other hand, if you choose the path of Zoloft or other antidepressants, your run the risk of side effects. Not just the side effects listed below, but even the mania phase of bipolar disorder can switch on when on Zoloft. To be clear, Zoloft, one of the most common SSRI's ( selective serotonin reuptake inhibitors ) is approved by the FDA for the treatment of depression, PTSD – post traumatic stress disorder (PTSD), and even social anxiety disorder. Clearly there are many cases where Zoloft can be a relief for people who do not experience negative side effects. Here are the know side effects of Zoloft aka Sertraline. Do you think that Zoloft and other antidepressants are benign, have little effect? Take a look at this terrifying list of possible side effects of Zoloft depression medication. After you read the list, you know it is worth weaning off zoloft or never starting in the first place. Ask yourself if it is not worth your time to explore other options? And these listed above are only the common side effects. Of course, one of the worst potential side effects is suicidal thoughts. Is Zoloft worth the risk? But if you already experience any of these Zoloft side effects, it is no wonder that you are choosing to get off of Zoloft as fast as possible. There are other options to taking Zoloft and other antidepressants. If you stick with these good habits, not only might you able to better manage your depression. But, you also might find yourself healthier in many other ways. Get to sleep at an earlier hour. Stay away from processed foods like the plague. Embrace real foods, especially vegetables, fruits, whole grains and lean proteins like eggs, low fat dairy, fish and turkey, foods know to increase Serotonin. Deadlifts, squats, pushups, presses and more simple but challenging weight lifts can do more to lift your mood than you would ever believe. You must be aware of discontinuation symptoms. If you tapering off Zoloft, please consult with a competent medical professional to properly manage reducing your doses of sertraline (Zoloft). Tips for Weaning off Zoloft Image Credit: Illustration by Joshua Seong. © Verywell, 2018.